Marimuthu Andiappan holds up a small sample of the copper catalyst. Photo: Joseph Xu, Michigan Engineering Communications & Marketing. The test reactor holds the catalyst in a tiny circular bed and exposes it to propylene and oxygen gasses. Photo: Joseph Xu, Michigan Engineering Communications & Marketing. This, in turn, could allow the oxygen to act as a catalyst, allowing oxygen molecules to bind with propylene molecules to forms propylene oxide. Propylene oxide is a precursor for making many plastics, toiletries and other household products such as antifreeze, paints and insulating foams. Currently, the production of propylene oxide is not particularly environmentally friendly, producing tons of salt and other unwanted chemicals, according to teh University of Michigan. 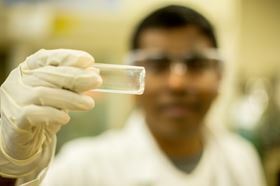 "Copper in metallic form has this unique electronic structure that activates the reaction pathway for propylene oxide more than the undesired pathways," said Marimuthu Andiappan, a University of Michigan graduate student in chemical engineering who worked on the project. The team made copper nanoparticles about 40 nanometers across, or roughly one-hundredth of the thickness of a strand of spider silk. 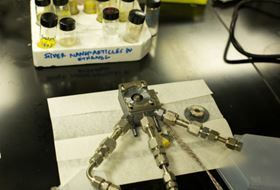 Researchers peppered tiny particles of clear silica with the nanoparticles and then floated a gas of propylene and oxygen over the resulting dust. In the dark, the copper oxidized, and only 20% of the gas converted to propylene oxide. But under white light, five times the sun's intensity, the copper stayed in the metallic state and turned 50% of the propylene into propylene oxide. "To our knowledge, this is the first time anyone has shown that light can be used to switch the oxidation state from an oxide to a metallic state," Andiappan claimed. The paper describing this work is titled: "Tuning selectivity in propylene epoxidation by plasmon mediated photo-switching of Cu oxidation state” and is published in the current issue of Science.